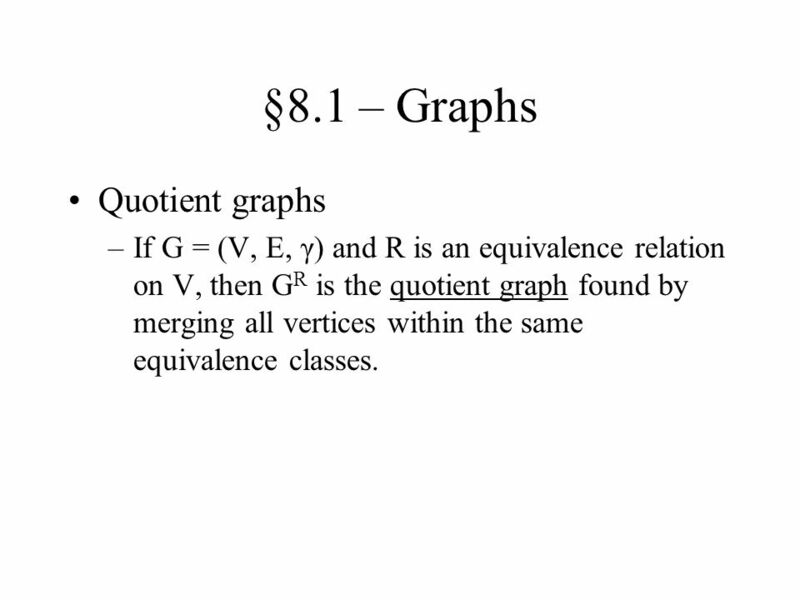 If G = (V, E, γ) and R is an equivalence relation on V, then GR is the quotient graph found by merging all vertices within the same equivalence classes. 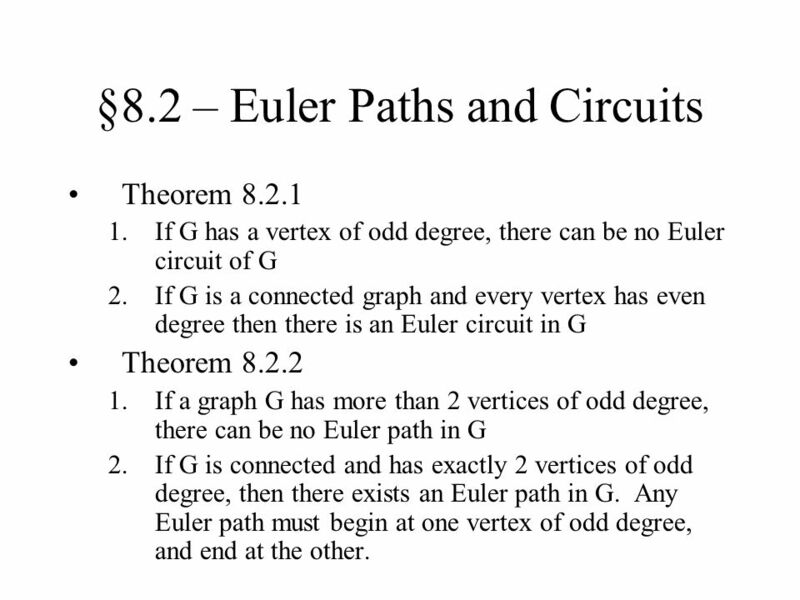 Theorem 8.2.1 If G has a vertex of odd degree, there can be no Euler circuit of G If G is a connected graph and every vertex has even degree then there is an Euler circuit in G Theorem 8.2.2 If a graph G has more than 2 vertices of odd degree, there can be no Euler path in G If G is connected and has exactly 2 vertices of odd degree, then there exists an Euler path in G. Any Euler path must begin at one vertex of odd degree, and end at the other. 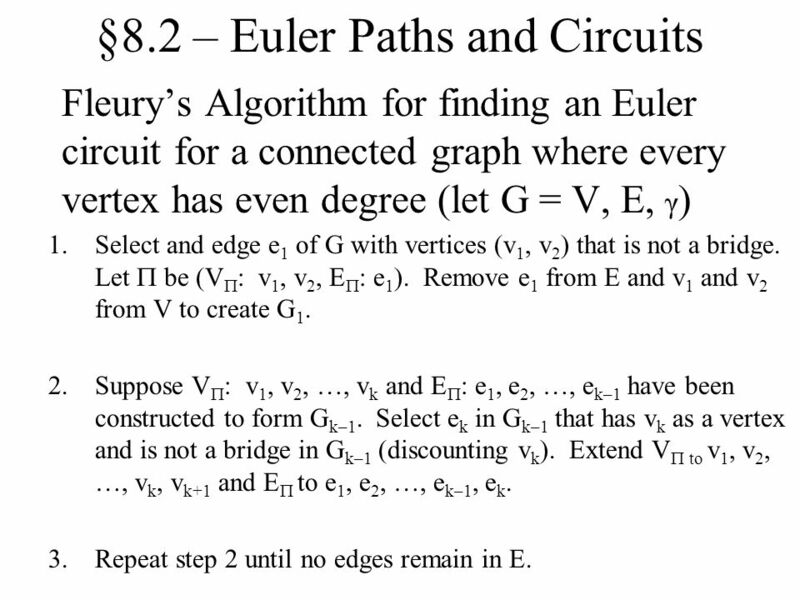 Fleury’s Algorithm for finding an Euler circuit for a connected graph where every vertex has even degree (let G = V, E, γ) Select and edge e1 of G with vertices (v1, v2) that is not a bridge. Let  be (V: v1, v2, E: e1). Remove e1 from E and v1 and v2 from V to create G1. Suppose V: v1, v2, …, vk and E: e1, e2, …, ek–1 have been constructed to form Gk–1. 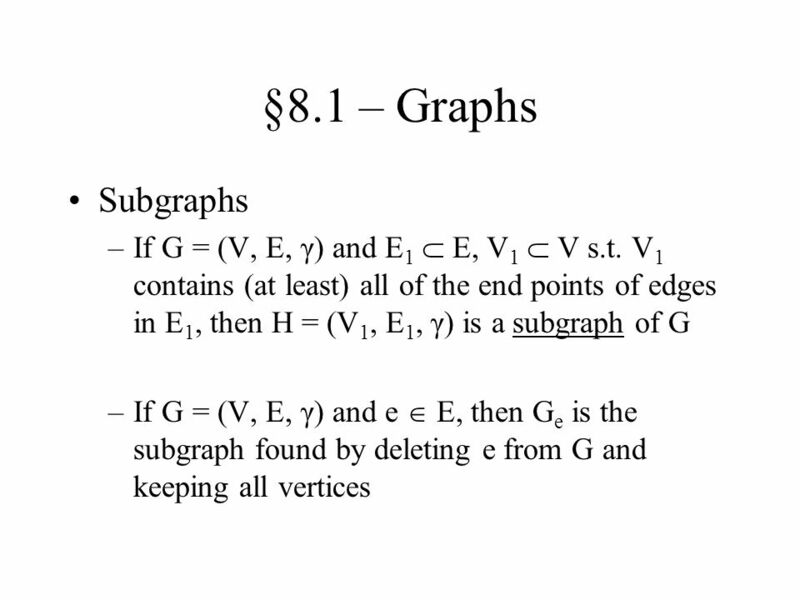 Select ek in Gk–1 that has vk as a vertex and is not a bridge in Gk–1 (discounting vk). 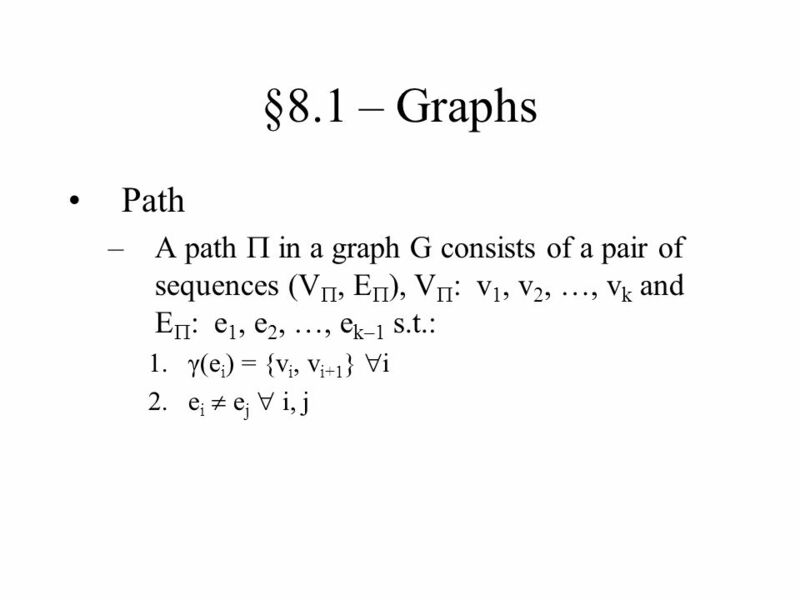 Extend V to v1, v2, …, vk, vk+1 and E to e1, e2, …, ek–1, ek. 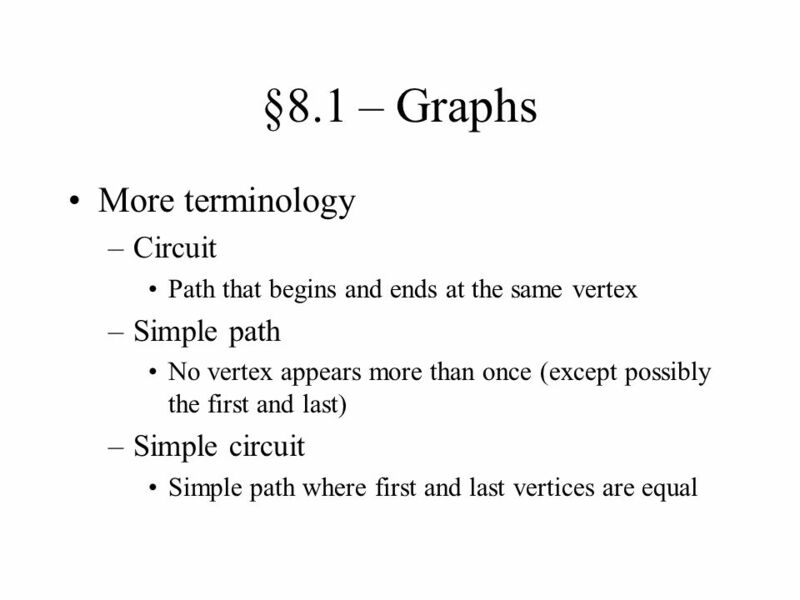 Repeat step 2 until no edges remain in E.
Theorem 8.3.1 Let G be a connected graph with n vertices (n  Z, n  2), with no loops or multiple edges. 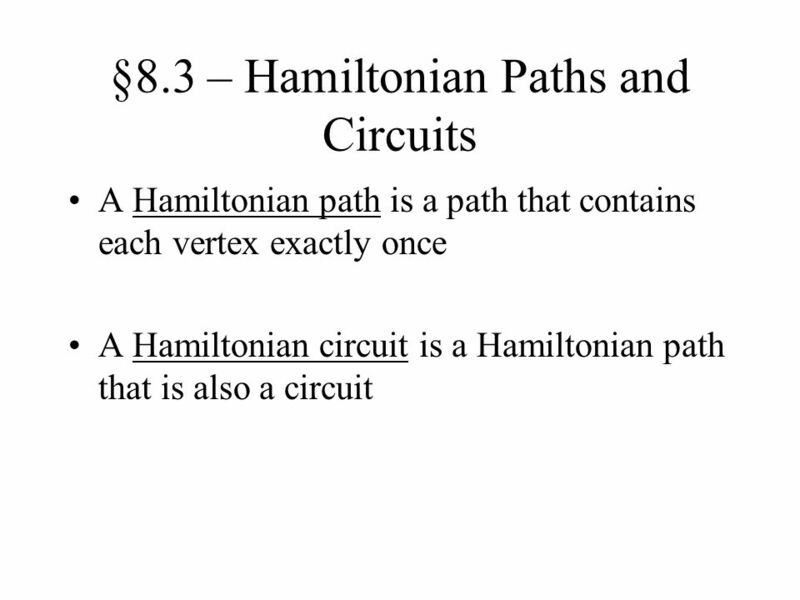 G has a Hamiltonian circuit if for any 2 vertices u and v of G that are not adjacent, the degree of u plus the degree of v is  n. Corollary 8.3.1 G has a Hamiltonian circuit if each vertex has degree  (n/2). 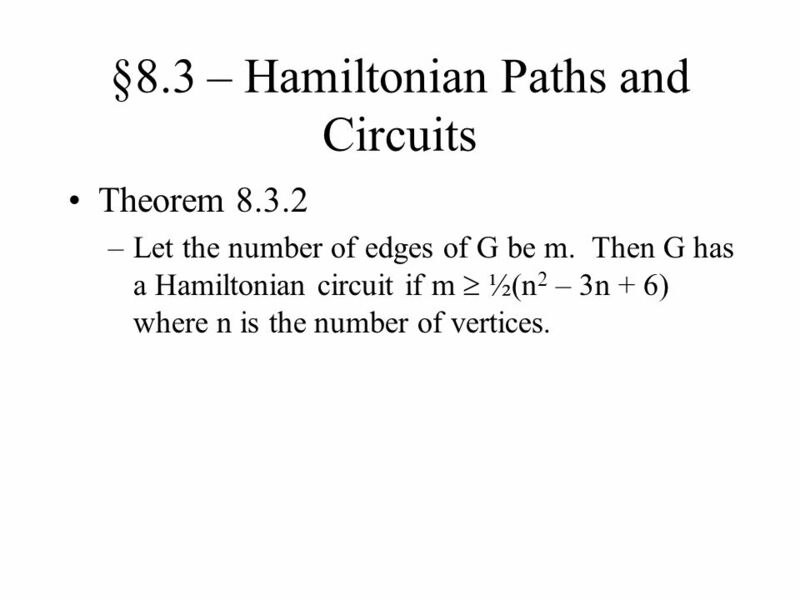 Theorem 8.3.2 Let the number of edges of G be m. Then G has a Hamiltonian circuit if m  ½(n2 – 3n + 6) where n is the number of vertices. 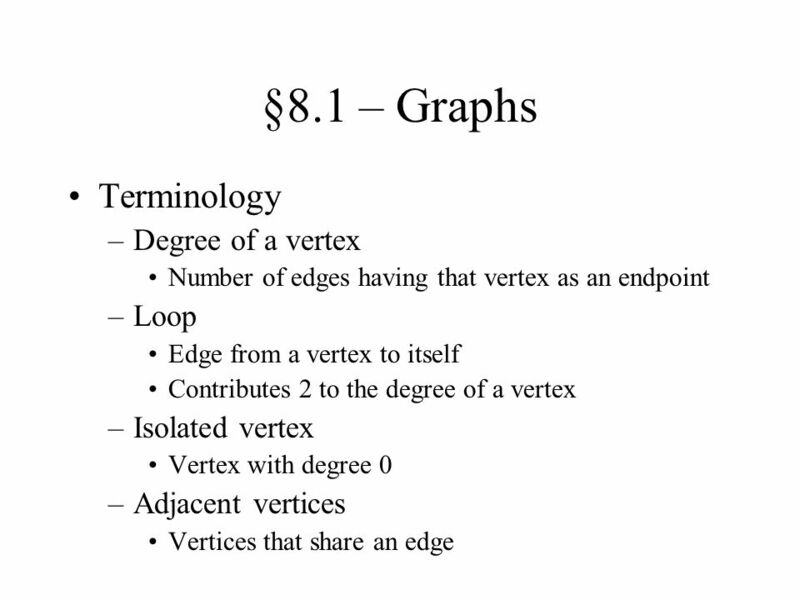 Download ppt "Chapter 8 Topics in Graph Theory"
Introduction to Graph Theory Instructor: Dr. Chaudhary Department of Computer Science Millersville University Reading Assignment Chapter 1. Walks, Paths and Circuits Walks, Paths and Circuits Sanjay Jain, Lecturer, School of Computing.  期中测验时间：本周五上午 9 ： 40  教师 TA 答疑时间 : 周三晚上 6 ： 00—8 ： 30  地点：软件楼 315 房间，  教师 TA ：李弋老师  开卷考试. 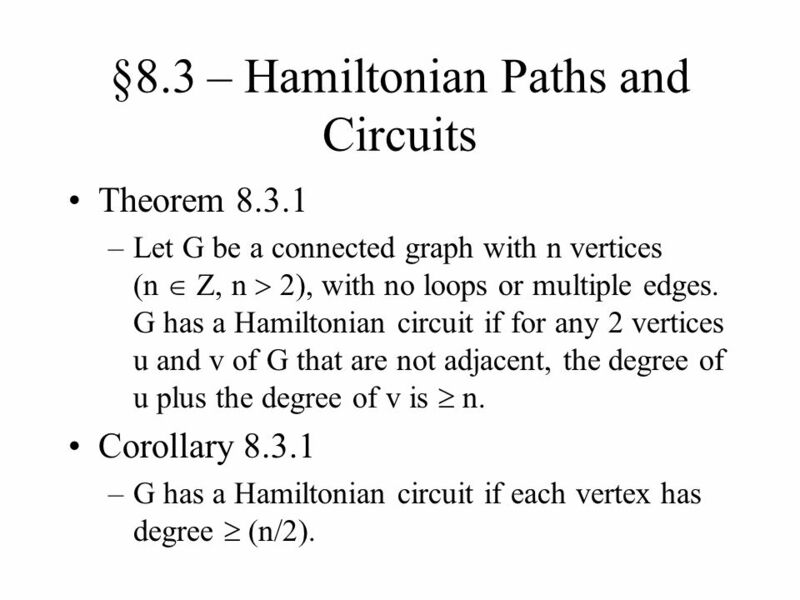 1 Lecture 5 (part 2) Graphs II Euler and Hamiltonian Path / Circuit Reading: Epp Chp 11.2, 11.3. 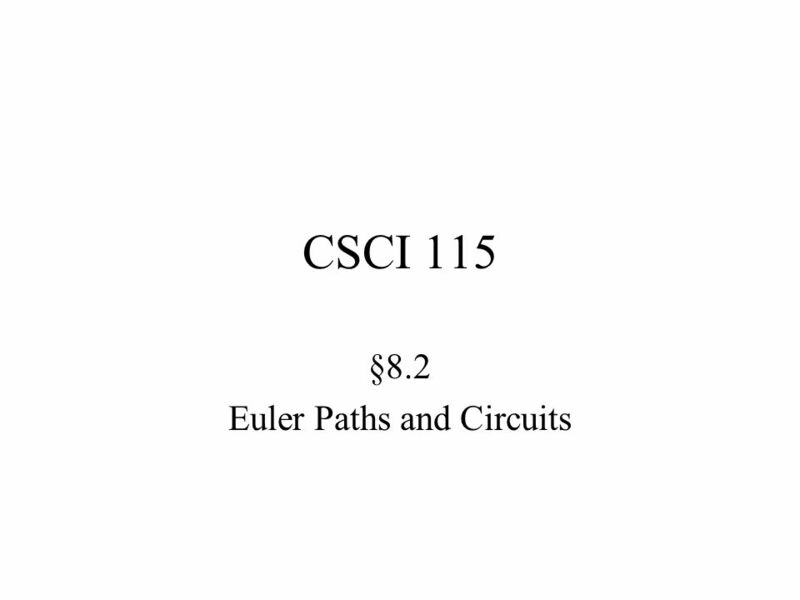 Lecture 21 Paths and Circuits CSCI – 1900 Mathematics for Computer Science Fall 2014 Bill Pine. 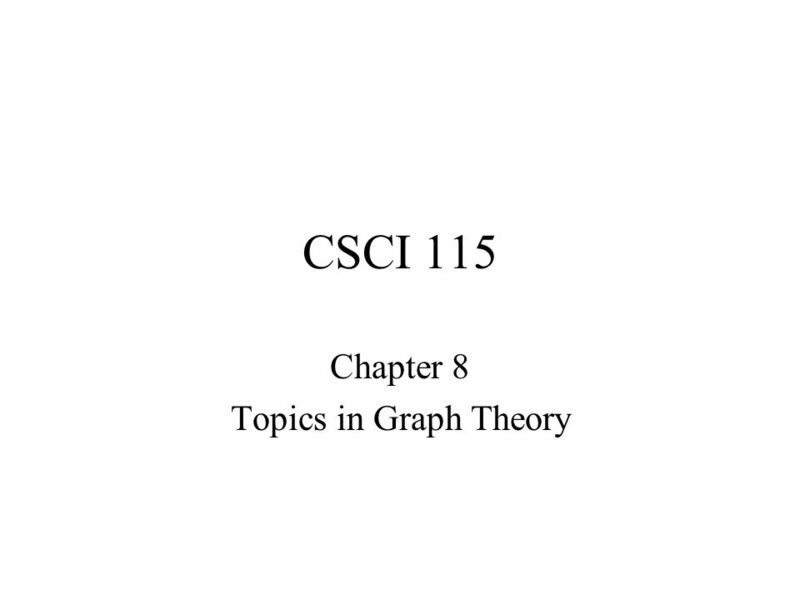 Section 14.1 Intro to Graph Theory. 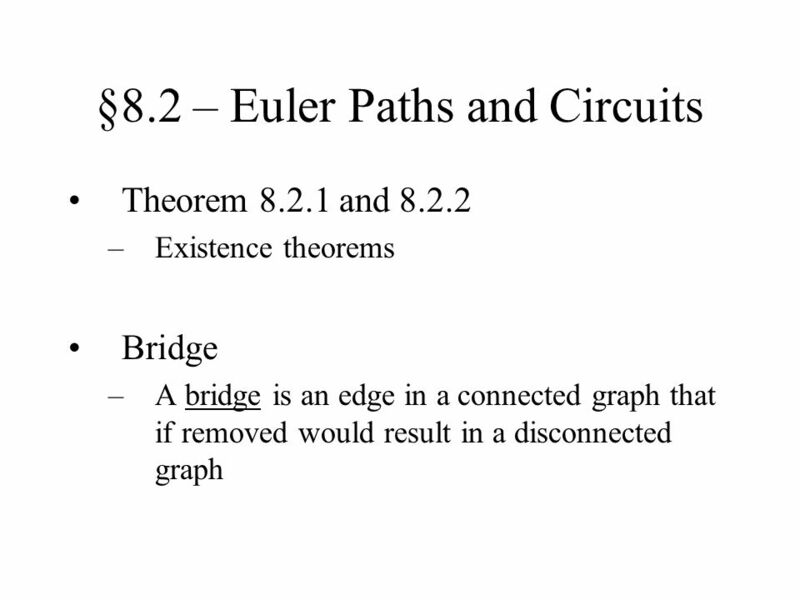 Beginnings of Graph Theory Euler’s Konigsberg Bridge Problem (18 th c.)  Can one walk through town and cross all. Section 2.1 Euler Cycles Vocabulary CYCLE – a sequence of consecutively linked edges (x 1,x2),(x2,x3),…,(x n-1,x n ) whose starting vertex is the ending. 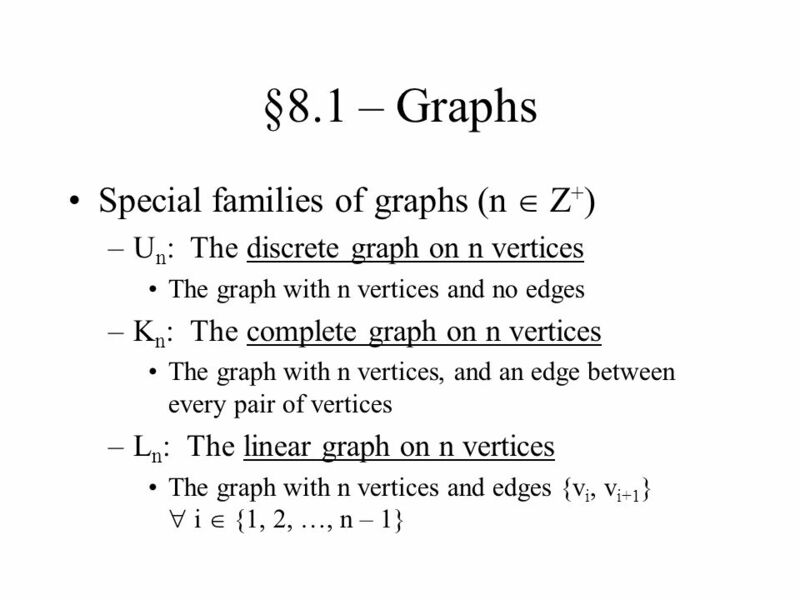 Discrete Structures Chapter 7B Graphs Nurul Amelina Nasharuddin Multimedia Department. 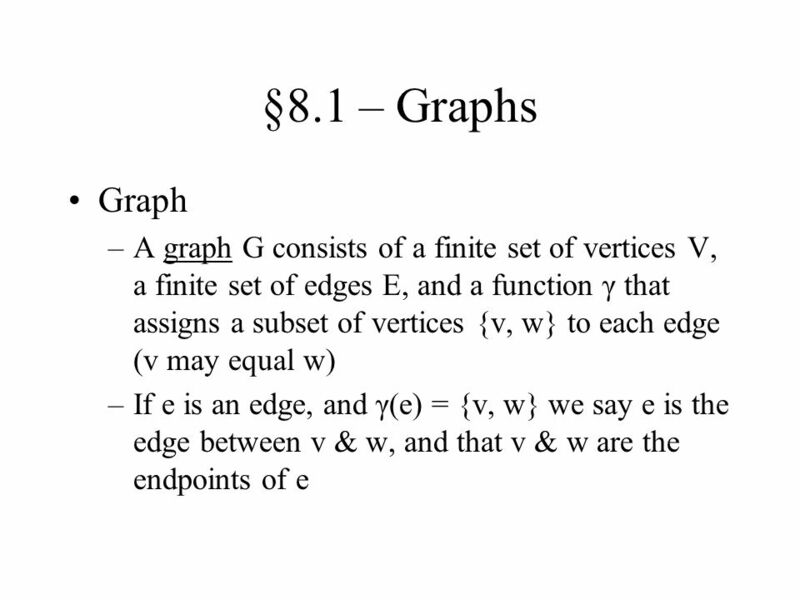 Math Foundations Week 12 Graphs (2). 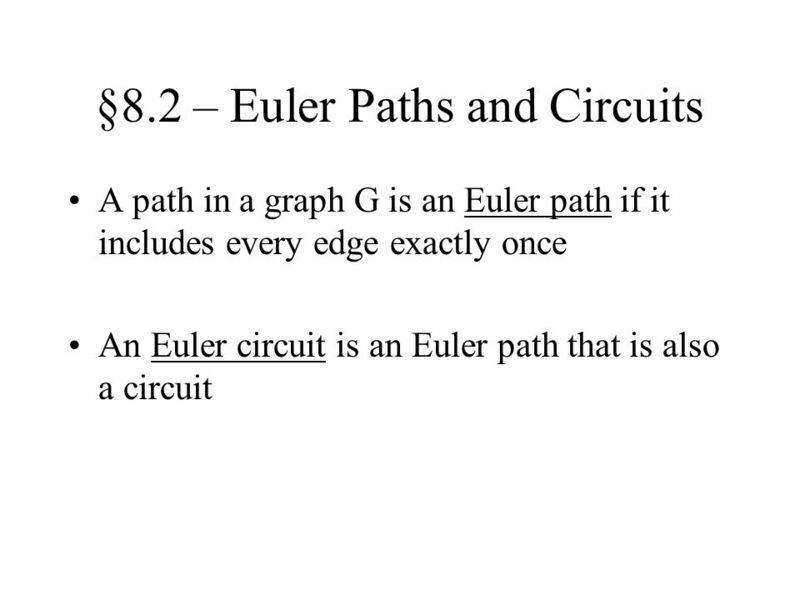 Agenda Paths Connectivity Euler paths Hamilton paths 2. 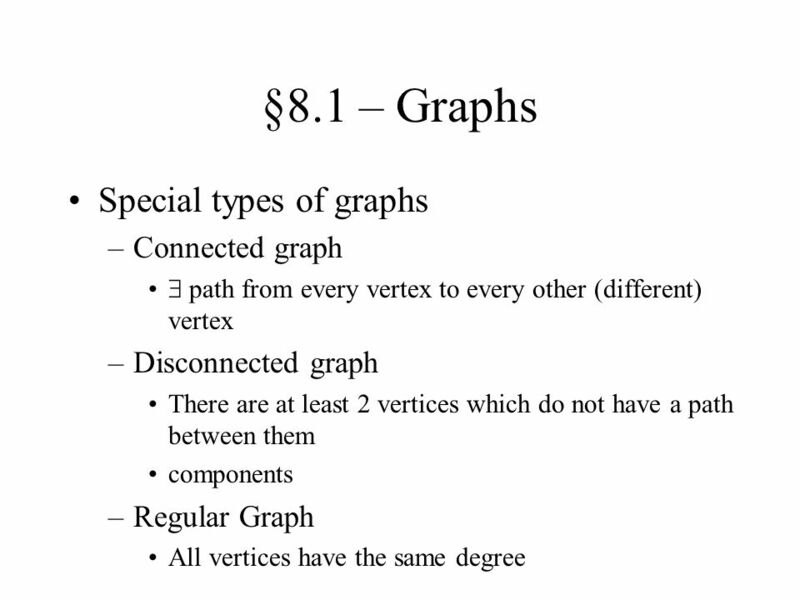 Discrete Structures Chapter 7A Graphs Nurul Amelina Nasharuddin Multimedia Department. 1 CMSC 250 Discrete Structures CMSC 250 Lecture 1 January 28, 2008. 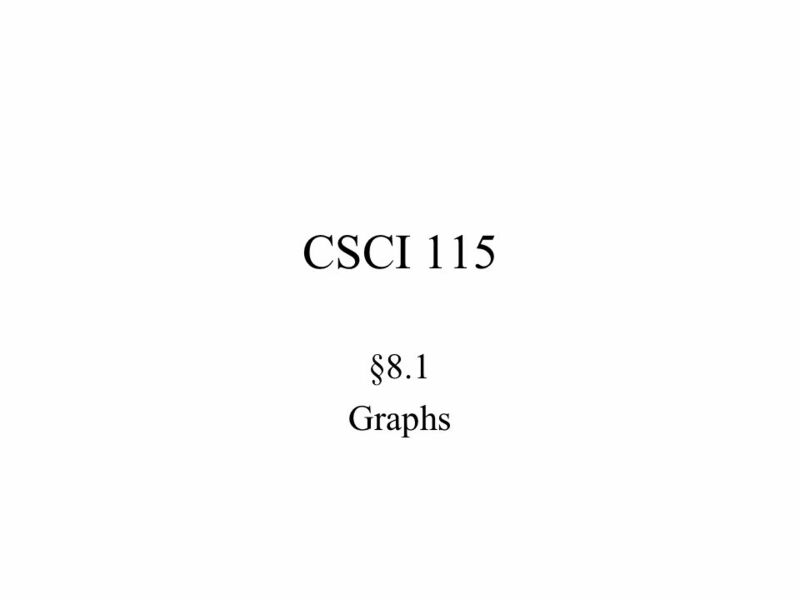 CTIS 154 Discrete Mathematics II1 8.2 Paths and Cycles Kadir A. Peker. 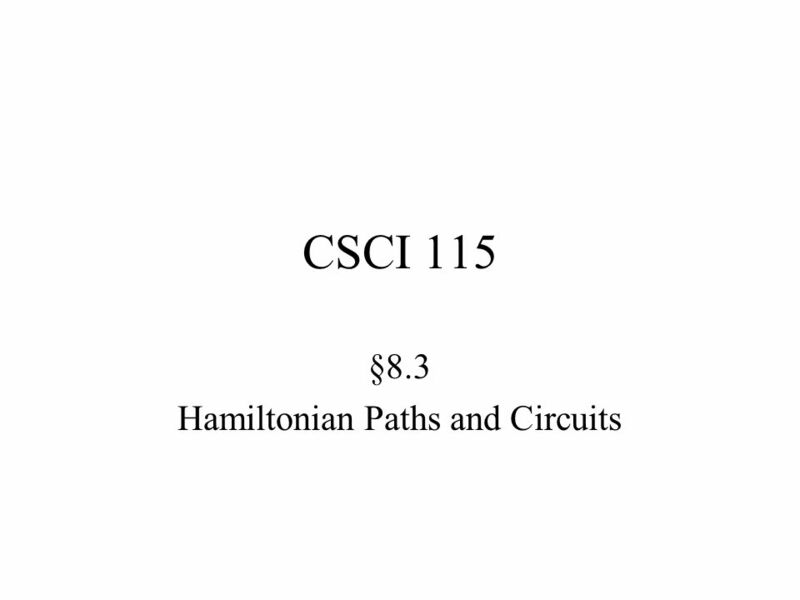 4/17/2017 Section 8.5 Euler & Hamilton Paths ch8.5.